A few weeks before my recent trip to California I was contacted by a French woman inquiring if I would be interested in staying with her and her family in their beachside home on the Breton Coast for a few weeks. She would provide me with meals, my own room and a weekly salary in return for me speaking only English to her 3 girls and giving her eldest daughter daily English lessons. If you’ve been to France than you know that August is the month where everyone deserts the cities and relocates to some seaside resort or another, and only the unfortunate souls are left to deal with the tourists and the hot and humid weather. So of course I jumped at the chance to get away to the beach. As much as I love Rennes, there’s not too much to do here on a sunny summer day. I had 1 week to recover after my international travels, and before I knew it I was on a train to Lorient, about 1 1/2 hours southwest of Rennes. 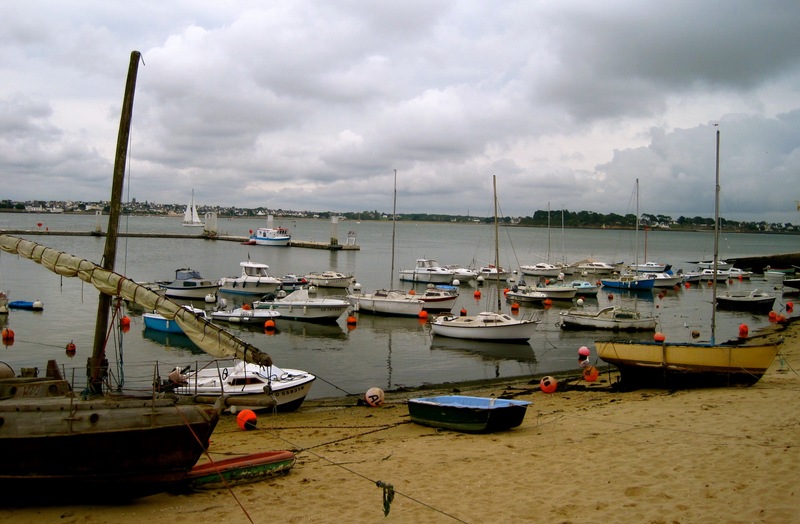 The friendly husband picked me up at the train station and drove me to the small town of Larmor Plage, about 10 minutes from Lorient. This couple grew up here, and though they are now based in Rennes they go to Larmor Plage practically every weekend during the school year and they also spend every holiday there. Their home is a stone’s throw from the beach, right in the very small centre ville and just next to the boardwalk. Not a bad place to spend 2 weeks, pas du tout. And then there are the girls. 3 adorable little schmeckens (as my friend Emma calls them). 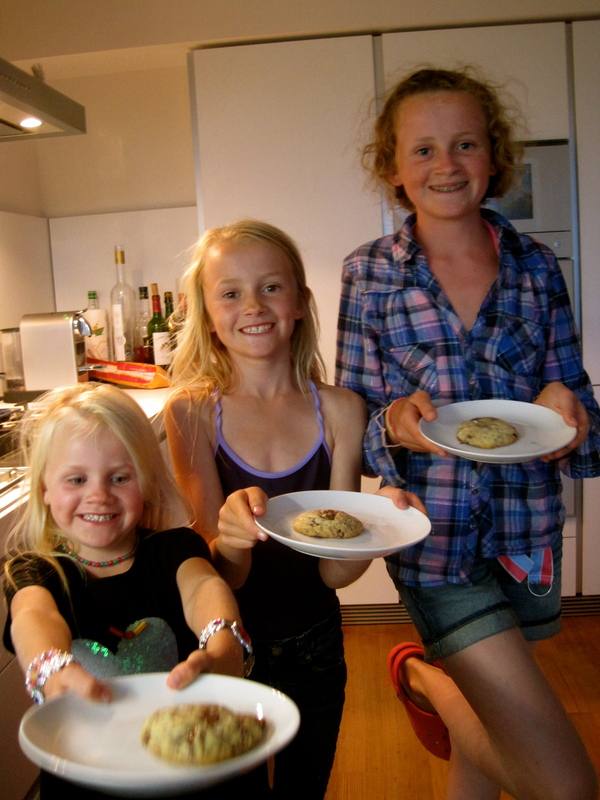 At 6,9 and 11 years old they are all energetic, unique, vivacious and adorable little monsters (at times angels). Hanging out with them for 2 weeks didn’t feel like work at all. I almost felt guilty being paid! I was so content to spend 2 weeks with a French family (even if I was speaking English most of the time) because I never lived with a host family when I was a student in France, and it’s something that I’ve always regretted. To sit down to 3 meals a day with a family teaches you things about French culture that would be difficult to learn otherwise. How they eat, how they communicate, how they live. But more surprising than the differences are the similarities, of which there are many. The teasing, bickering and affection that are part and parcel of every daily family routine. Another amazing benefit of staying with the family was the food. The food. Oh my god. Every meal, even if it was simple and thrown together quickly, was delicious. Every meal included fresh seafood or meat, served with some sort of salad and bread or grain, and of course cheese and dessert of some sort. And that was just the home cooked stuff. We also went out to eat many times. I had moules frites quite a few times I can tell you, and so many delicious filets of fish. 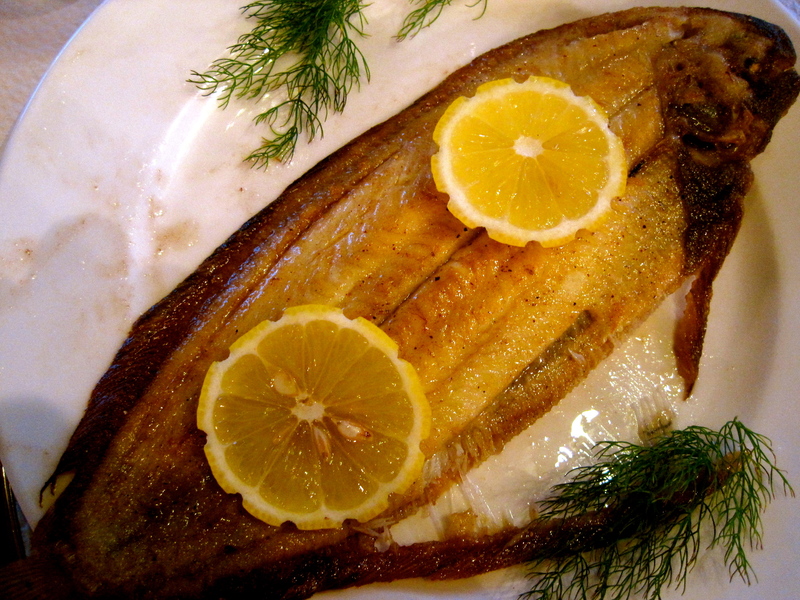 Brittany can’t be rivaled for its fresh seafood. On my last night we had a remarkable meal at a very traditional restaurant located in an old hotel. This meal left even them impressed, which is really saying something as this family may be even more gourmand than my own! 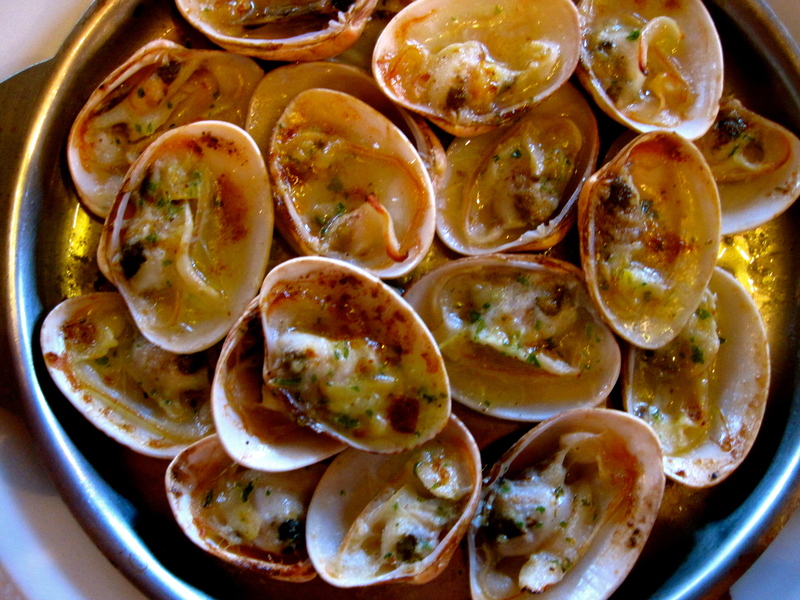 For starters I had poulardes (clams) which were drenched with butter and topped with garlic and parsley and then baked in the oven. By the time I had forked out the last morsel of clam my hands and my chin were absolutely covered in butter. The husband had ordered the same thing, and of course he ate them impeccably. So impeccably in fact that he didn’t even need the wet towelette that came with the dish: he gave it to his 6-year-old daughter. I think I would’ve needed 3 of those measly little towels just to clean the butter off the fingers on my right hand. Alas, I will always be the awkward americaine. The wife ordered bulot (sea snails) for her starter, and gave about half of them to me. Don’t let the name fool you, these little buddies are delicious, especially when dipped in a homemade aioli. And this particular aioli seemed to be where good garlic goes to die. I had bulot for the first time when I had my infamous seafood platter, and I was horrified to discover that I had eaten them all wrong (although I suspected this at the time). 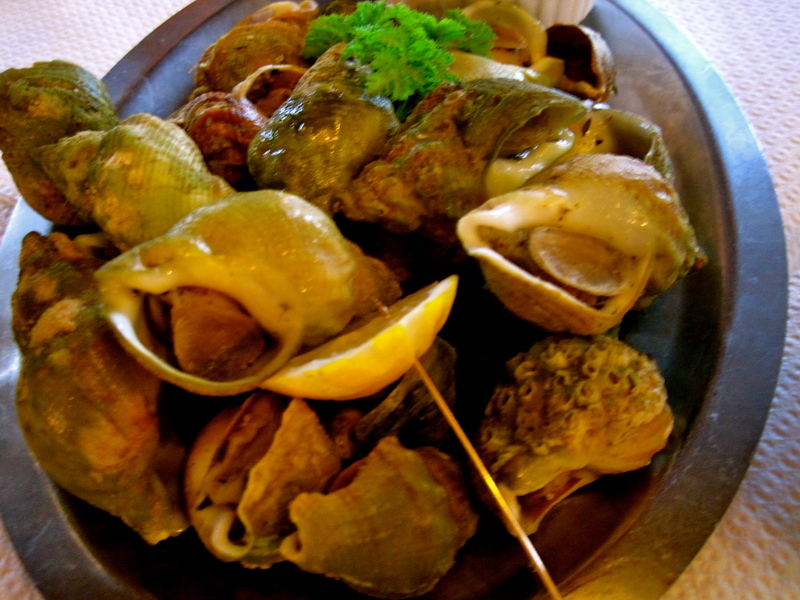 There is an art to eating a bulot: Spear it with the small silver pick, and then gingerly using your fingers you take off the ‘foot’, a hard little disc on the very end of the snail. Then dip the snail into the mayonnaise and enjoy. Another dining mishap: when picking the foot off of my first bulot I squeezed too hard and the thing shot off of the pick and into my lap (I still ate it of course). The husband was kind and pretended he hadn’t seen but I saw a small smirk form as he lifted his glass of rosé to his mouth. For the main course I had sole meunière. If any of you have read Julia Child’s book My Life in France you will recognize this as the first plate she had when she moved to France. It is the very dish that made her fall head over heels in love with French cuisine. The husband taught me how to properly dissect the whole fish, and I am proud to say that I passed the course with flying colors. At least I was able to eat one thing properly that night. But we weren’t just sitting around eating the whole time. We also went on many excursions on their motor boat (they also have a sailing boat). In the 2 weeks I was there I saw Port Louis, a town just across the bay from Larmor Plage where there is an ancient citadel. The citadel used to be the operating headquarters of the French India Trade Company and is now a museum. 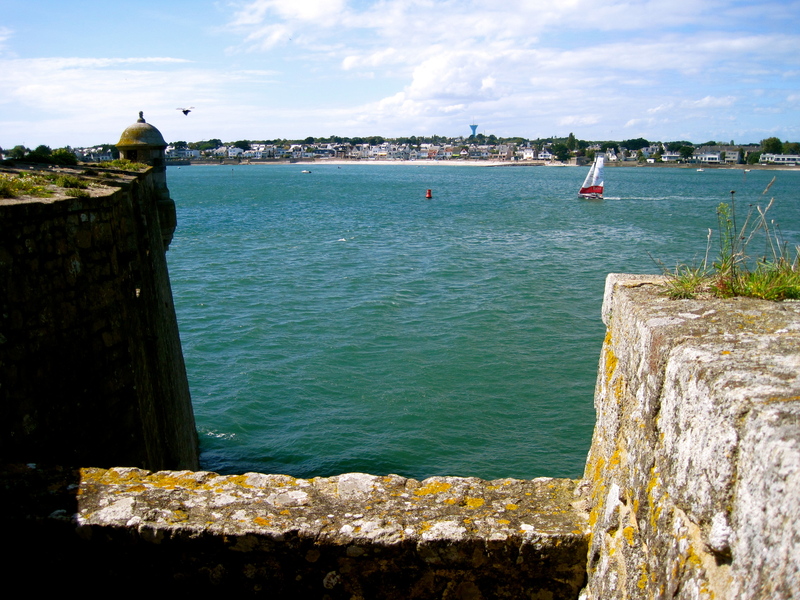 It hosts ramparts that have sweeping views of the ocean and the bay. I love being in old places like this in France and trying to imagine the people who occupied that space centuries ago. For example, Napoleon was imprisoned there and later triumphantly returned with his army when he was free (and in power) to gloat. 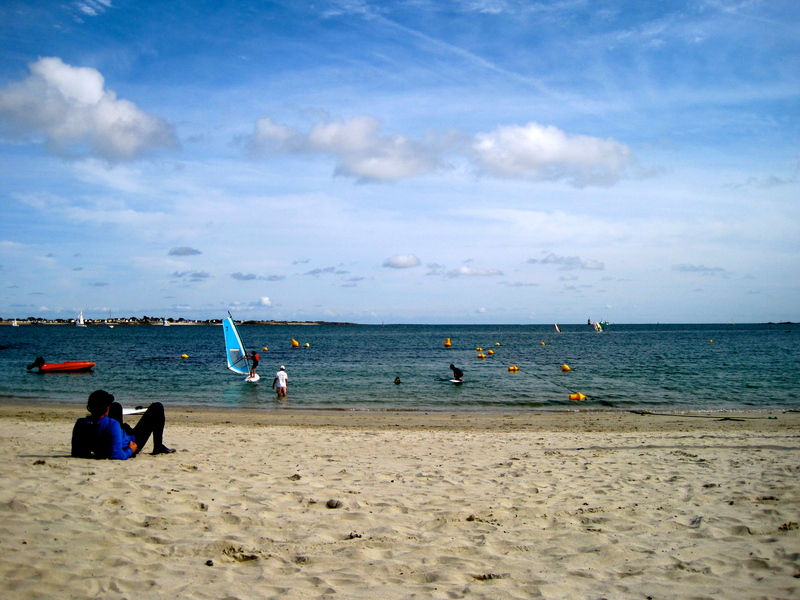 We also went to L’île de Groix, a small island off the coast of Larmor Plage. We spent the day on an idyllic crescent beach with vast amounts of white sand and abundant tide pools, located underneath sweeping cliffs. We had a picnic, French style. I don’t want to make you jealous but the menu included fresh shrimp, saucisson sec, fresh chipolata sausages and filet mignon barbecued on the beach, cherry tomatoes, fresh melon, roast chicken, several cheeses and wines and for dessert, far breton (I’m sure there will be an upcoming post dedicated soley to this amazing Breton dessert). After a beautiful day at the beach, they swept me off in their boat to the largest port of the island, where we docked the boat and meandered around the quaint island streets up to the center of the town. What is it about islands? Their ambiance is always so much slower, calmer and quieter than anywhere on the continent. On my last day we took the boat out to the open ocean and followed along the contours of la Côte Sauvage (the wild coast). We turned off into the Laïta river at the Port du Pouldu. After passing through the port, we went for a two hour promenade upstream. 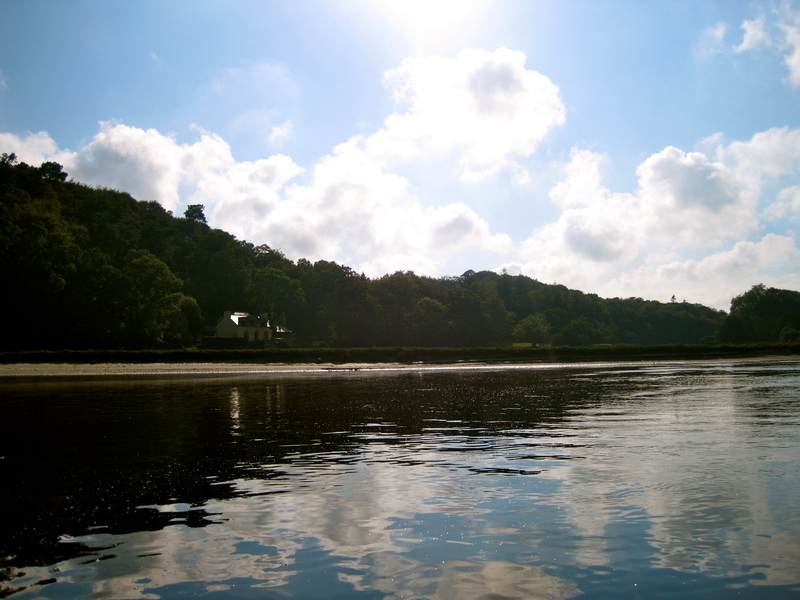 As it was extremely low tide, we had to go very slowly in the boat, meandering through a maze of sand banks. We got stuck a few times, and each time the girls would splash happily out into the warm shallows to tug the boat along into deeper water. By the time we turned around and headed back to the port, the tide was up and so was out appetite, and that is when we headed in to enjoy the amazing meal I wrote about earlier in this post. I can just picture you at that dining table as I sit here with a warm smile on my face. Wonderful post. Keep them coming. H & MA! I miss you guys and all my Leucadia family. Eat some avocados for me! Bises. Oh, that brings back memories! My second year as an assistant was at the Lycée in Port Louis – it was right across from the citadel and the ramparts. I used to walk down and sit by the water during my breaks (the students were really horrible lol). What a beautiful place to be an assistant! Are you still in France? Take care, and thanks for reading. Yep, still here after five years in Bretagne and three now in Paris! Yeah, it’s hard to leave France isn’t it!? I’m heading to Paris the beginning of October. I lived there for 4 months, but it was such a long time ago! Any suggestions for restaurants, little know sites, etc? Your thoughts are much appreciated! Your above post reminded me of how hard it is to eat certain foods in public. My husband and I along with another couple will be in your beautiful part of the world next week. 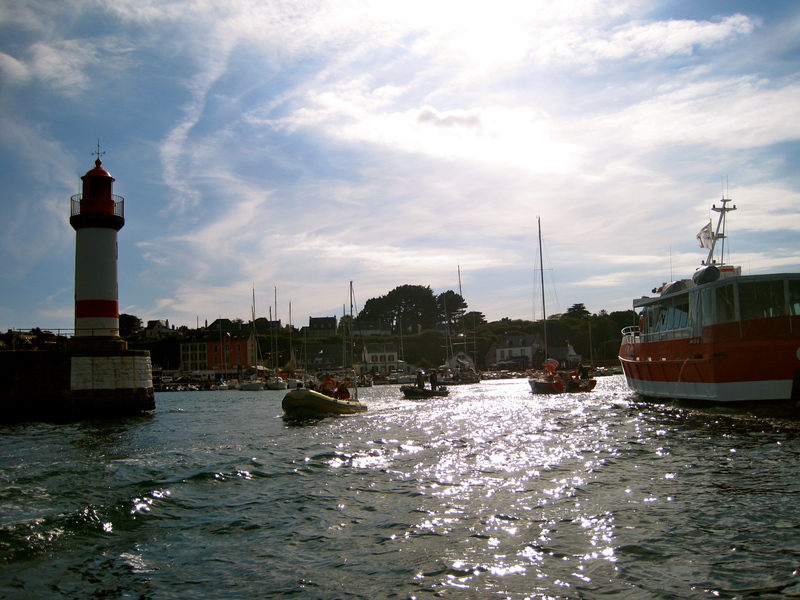 I enjoyed the moules frites on my visit to Cancale…now I want that tower.!!! I would love some pointers on how to tackle it and would it be a faux pas to share some between 4 people? I usually see it listed for 2 persons. 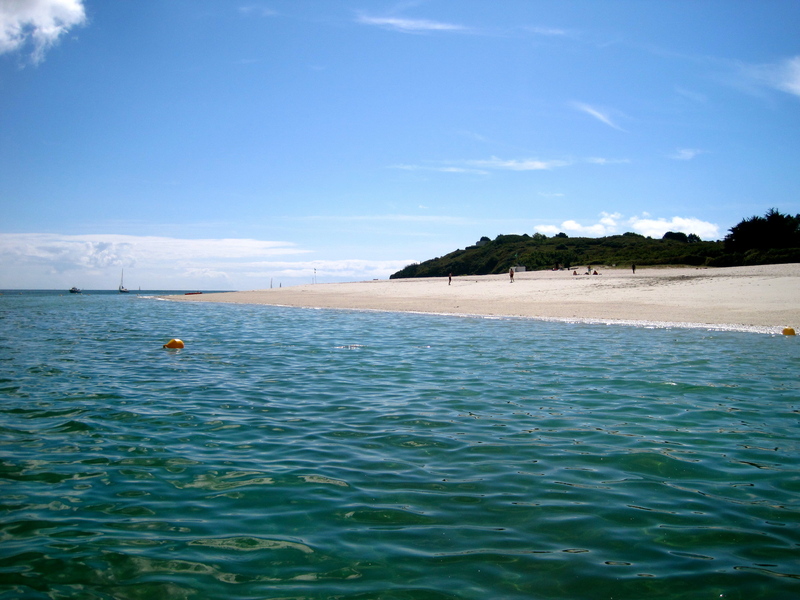 We will be stopping in Cancale next week 9/22 and then make our way to Quimper. Your thoughts are most appreciated. My advice is not to worry about faux pas too much! Us Anglophones will never quite blend in here, and it’s all part of the fun. As for sharing the seafood platters, at restaurants that specialize in them they will offer varying sizes, so you could definitely split one of those amongst 4 people. Would you want to though!? You might find yourself tempted to stab your dining mates with a fork in a mad attempt to get one more oyster. Maybe that’s just me though? Cancale and Quimper are both beautiful! Enjoy your trip, safe travels, and I’m happy to answer any other questions you might have. Bon voyage!